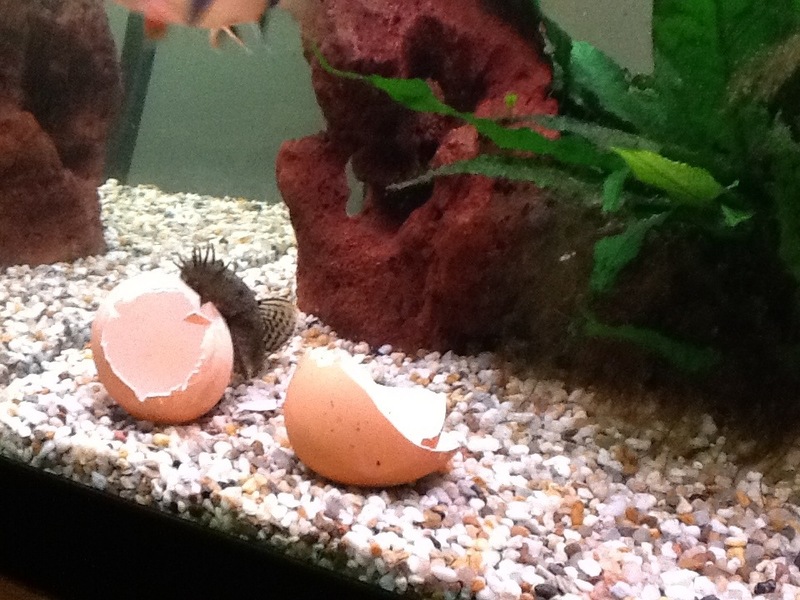 Happy Fish, Egg Shell and Worms! Hi all! 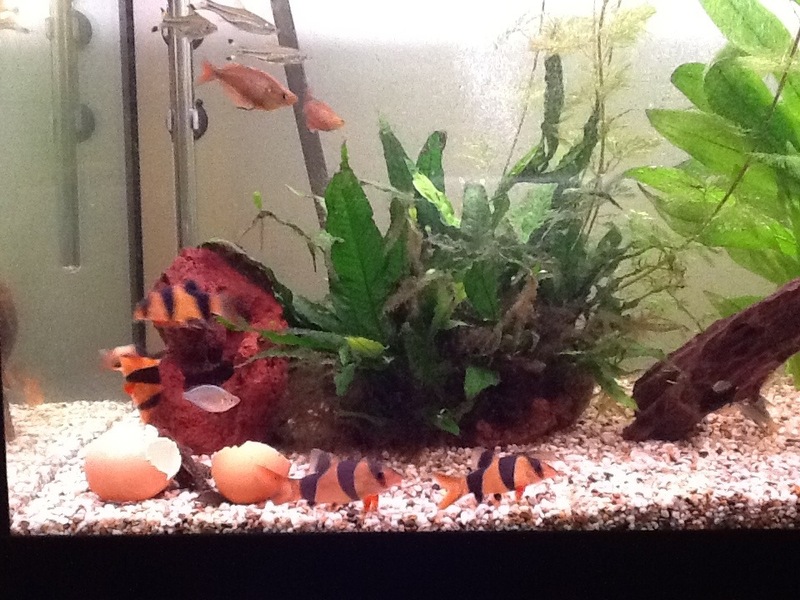 The community tank is AOK, all fish are healthy and the Clown Loaches haven’t eaten the apple snail or zebra snail yet! The round-bellied Upside Down Catfish is fine so perhaps it just ate too much. The red Rainbowfish are beauties, the most dominant is bright reddish orange and the others range from a dull bronze to yellow and orange. I do like a colour changing fish. The little neon Rainbowfish are just as active and two are starting to look like mini-plaice as they are noticeably larger. I save egg shells to crush for use in the garden, piling them up in a bowl in the kitchen. I have found that the fish like them to munch on, play with and generally sit on (depending on the fish). I had half a shell from a boiled egg and gave it an extra clean by putting it in a cup of boiling water. I then dropped it in the tank and the Clown Loaches loved snuffling around it, sitting in it, pulling at the remaining membrane inside – that’s when Stephen the Bristlenose Catfish wasn’t sucking on it. I fished (hahaha) it out the next day and have popped one in the tank a couple of times a week. I like to think it would help with calcium levels a tiny bit to help the apple snail but it is a good fish toy anyway. 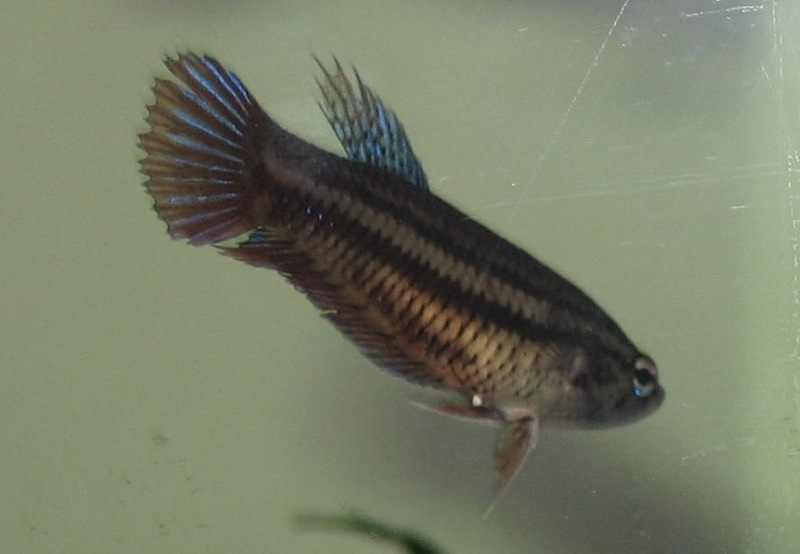 I splashed out £2 at Amazon Aquatics in Leigh and bought a small sieve-like feeder to suction to the tank side. I defrost a cube of blood worms, pop them in there and the fish munch them all in less than a minute. 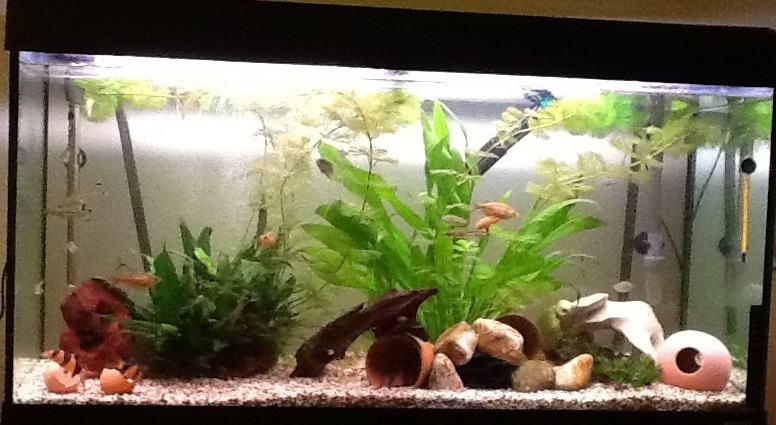 The Clowns and Rainbowfish are especially keen. I give them this as a treat about once a week and have a selection of dried food types suitable for all the different fish in the community. I only feed them once a day and they always eat up quickly. I’ve had the aquarium for about a year now as a birthday present from Super Husband and I still love it. Luckily for me it was my birthday again a couple of weeks ago and Super Husband bought me….another 200 litre aquarium and cabinetHOORAY for birthdays! This will be a single species (ish) tank so I will post pictures and good news soon. Hope all you fish fans are happy. 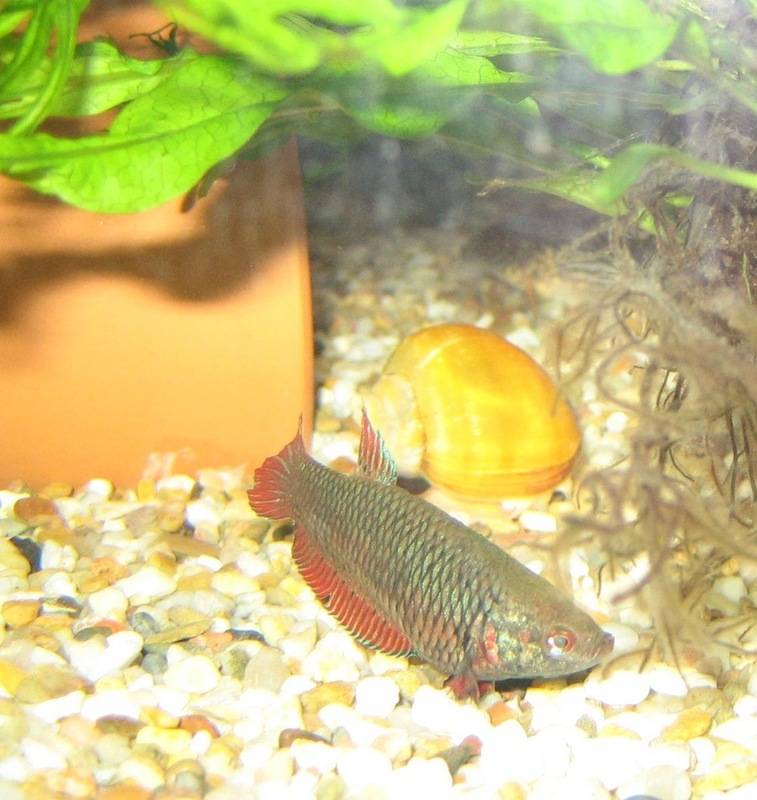 Two female Bettas have joined the community along with three snails; an Apple and two Ramshorn. The larger Betta (in the first pic) pecked at a Ramshorn Snail when I added them all to the tank yesterday. I haven’t seen that snail at all today and the other is looking pretty lifeless… Maybe it’s resting. In a fish’s tummy?! The Apple Snail is a big bruiser and is cruising around happily. 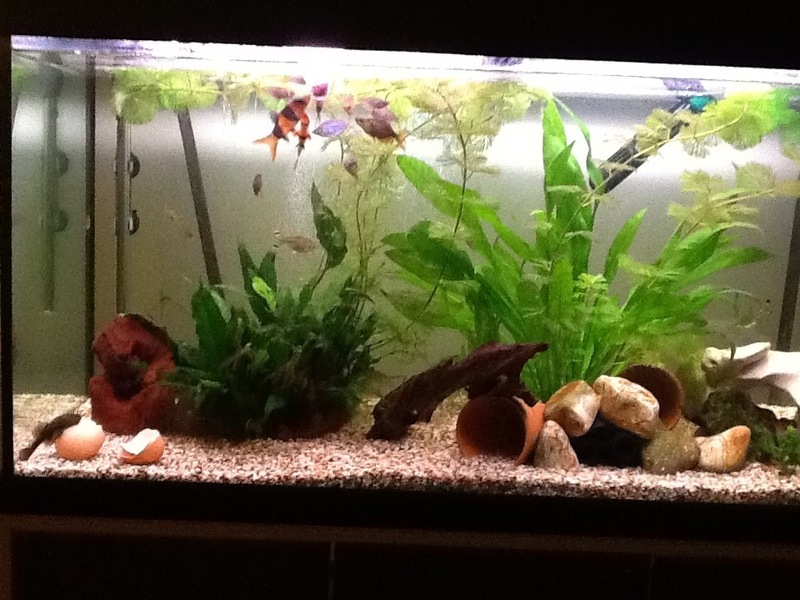 I read that female Bettas establish a pecking order but do not tear at one another as the males do. One is much larger than the other so there should be no indecision there. Mr Cichlid is interacting with the larger lady quite a lot. 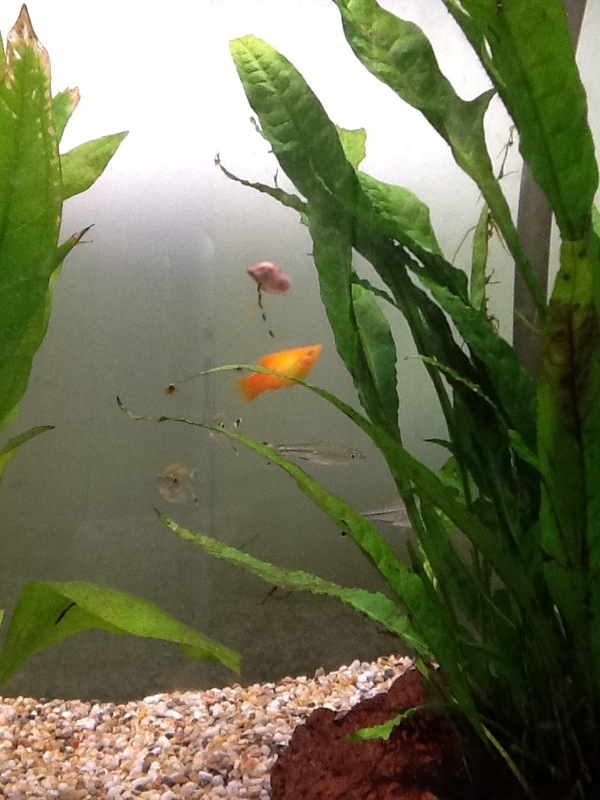 Mrs Cichlid is spending a lot of time in the plant attached to stone and warns off any fish who come too close. Maybe they have decided on their territory at last, spurred on by the new additions. Snail Trail or Fish Thinking? Snailor the snail is ploughing through the algae but is pulling a train of poop – and I was thinking the snails would help to clean up. The picture looks like Netty the Platy is spouting a cartoon think bubble. What do fish think about?